Border Crossing Project map. Photo courtesy of FERC. 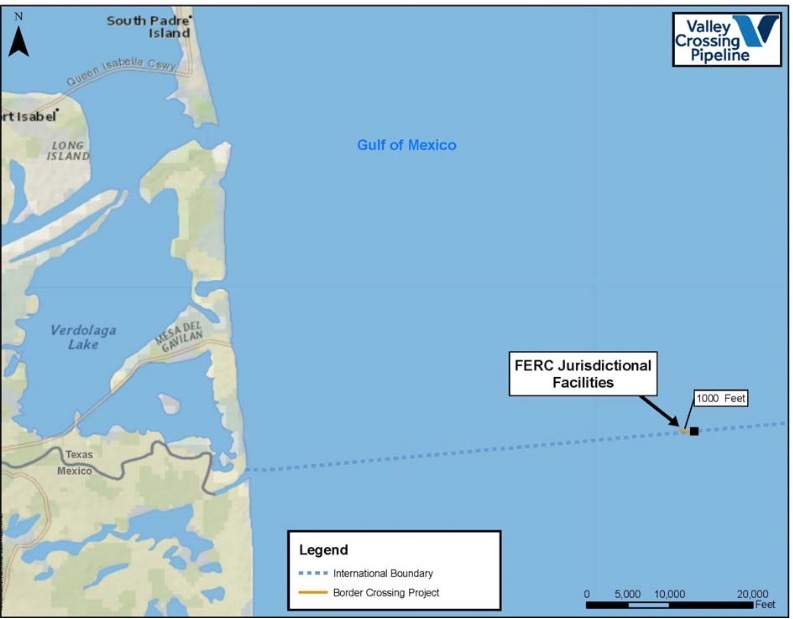 FERC has approved Enbridge’s request to commence construction of the Border Crossing Project, which includes a border-crossing facility with approximately 1,000 feet of 42-inch-diameter pipeline extending from a point in Texas-state waters approximately 30 miles east of the City of Brownsville in Cameron County, Texas, to the international boundary with the State of Tamaulipas, Mexico in the Gulf of Mexico. According to FERC’s James Martin, the company will also install a subsea tie-in rather than an above-water tie-in to reduce potential stress on the pipelines and lower the project’s environmental footprint. Once completed, the project will be capable of delivering up to 2.6 billion cubic feet (Bcf) of natural gas per day. It is expected to begin operations in October 2018.